Ice. It’s melting. And new findings focused on the Alps show it’s going to keep disappearing at an alarming rate even if we cut emissions. The research, released in the Cryosphere on Tuesday, show that glaciers in the Alps will shrink to half their current area by midcentury even if carbon pollution magically dropped to zero tomorrow. That of course won’t happen, but how much more ice we lose depends largely on when and how rapidly the world curtails its emissions. There’s no shortage of signs of how climate change is already hitting glaciers in the Alps (and the rest of the world, for that matter). Previous research has shown that the mountain glaciers have lost nearly half of their volume between 1850-1975 with losses accelerating in the following four decades. The results are clear beyond journal pages, too. Summer ski resorts have closed due to the meltdown. Concerned citizens have draped glaciers in reflective material to keep them cool. But the new research shows that’s a losing battle as temperatures continue to rise. Researchers constructed a daisy chain of models and data that included data on ice area, volume and elevation as well as global and regional climate models. The study also includes an ice flow model that specifically relates to how dynamic glaciers can be, a first for this type of study. The data on where ice currently stands was then run through a suite of model tests where carbon emissions rapidly fall, peak and start declining by midcentury, or continue rising in line with current trends. 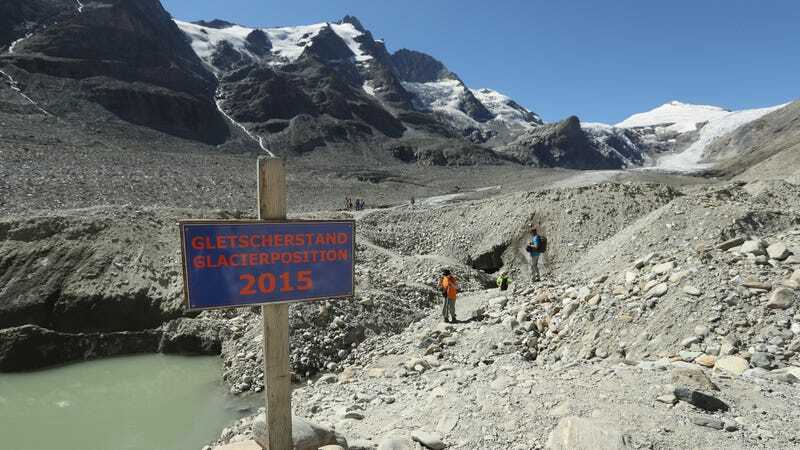 The results show that no matter how you slice it, the Alps’ glaciers are in trouble. The Earth system is like a massive, slow moving cruise ship that takes centuries to course correct. So all the carbon dioxide humans have already committed to the atmosphere means we’ve baked in climate change impacts that will last our lifetimes. For the Alps, that means that the already afflicted collection of glaciers will lose half their area and 45 percent of their volume by midcentury regardless of what we choose to do right now. But then there’s that whole question of what happens next. “For the second part of the 21st century, the evolution is determined by future emissions,” Harry Zekollari, a post doctoral researcher now at TU Delft, told Earther in an email. If carbon emissions continue unabated, basically all ice will be gone by 2100. If the world gets its act together by mid-century, nearly 80 percent of glacier volume will still be wiped out, while cutting emissions dramatically in the next few decades will result in a 63 percent volume loss. Not great choices to be sure, but clear ones nonetheless. And how much ice exists (or doesn’t) is a huge deal for France, Switzerland, Italy, and other countries that rely on the glaciers. They provide economic opportunities in the resort towns scattered throughout the Alps. More than half of Switzerland’s energy comes from hydropower that glaciers provide the fuel for. Losing the ice will mean losing power, money, and a regional identity. And it’s up to the world to decide how much it lets go of.